Simple and easy to use LDAP Browser and LDAP administration tool designed to suit the needs of both novice and expert users and administrators. 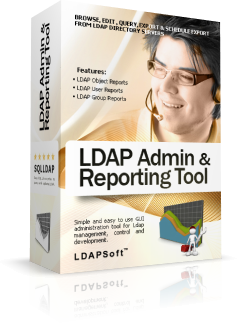 A Professional LDAP administration tool for expert ldap users and administrators. An Active Directory® Administration and Reporting Tool. 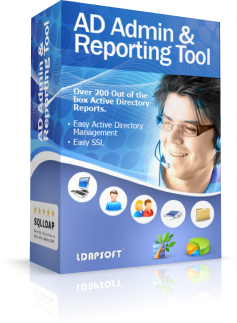 A professional reporting & auditing tool. 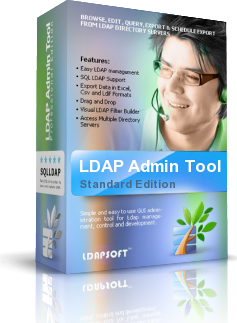 Powerful and easy to use Windows & Linux GUI administration tools for Ldap management, control and development. Browse, Edit, Query, Export and Schedule Exports from LDAP Directory servers safely, securely and reliably. SQLLDAP Support, you can now export and import records as update, delete and insert statements. With our LDAP tools you can easily access and manage OpenLDAP, IBM Tivoli Directory, Microsoft Active Directory, SUN One Directory, ADAM, Netscape/iPlanet, Novell eDirectory, Siemens Directory, Lotus Domino, Oracle Internet Directory or any other LDAP v2 or LDAPv3 directory. 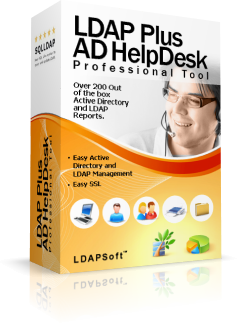 LDAPSoft LDAP Browser: A free LDAP browser by LDAPSoft. Simple yet powerful Active Directory administration and Reporting solutions. Our Active Directory reporting tools are cost-effective, simple, easy to use and comes with over 200 out of the box reports and over 200 predefined one click searches. Reports can be easily customized and scheduled to suit the needs of System Administrators, IT Managers and System Auditors. Our tools provide reports that assist in both compliance (SOX, HIPPA) and management reporting. LDAPSoft AD Browser: A free AD browser by LDAPSoft. 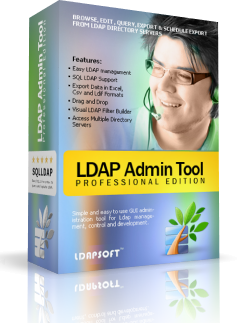 "IMHO, Ldap Admin Tool Professional Edition is the most comprehensive Ldap and Active Directory tool ever - SQLLDAP rocks!. " 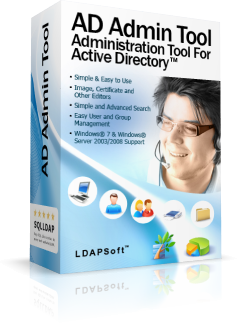 "We found AD Admin & Reporting Tool by LDAPSoft to be the best software available in the market for active directory administration and reporting." Let me just say that the LDAP Admin Tool has been a god-send. It has improved the work flow for our support staff in ways that you cannot imagine. Our processes and procedures for LDAP adds, deletes and modifications is so improved since we found and started using this tool.